BRL Test for certified premium used. The E7402A EMC standard analyzer provides the capabilities you need in an analyzer to make in-house EMI precompliance testing a reality. Radiated emissions When combined with a broadband antenna, the E7402A provides the capabilities to check for radiated emissions coming from your DUT. This is best done in an area that is free from reflective objects such as an open area or EMI chamber. 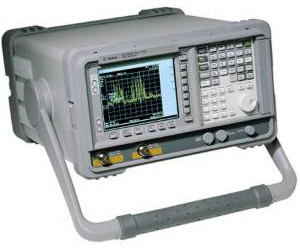 Conducted emissions Test for noise or interference placed on power or data lines by coupling the E7402A instrument to the power or data line through a line impedance stabilization network (LISN) device or absorbing clamp. Diagnostics and problem isolation If you have an emissions problem, you can use the E7402A with an 11940A or 11941A close field probe to isolate and diagnose the source of the problem. BRL Test is your one stop shop for all major EMC equipment manufacturer's. Satisfaction guaranteed. Warranty. Backed by BRL Test's World Class Repair Lab.